Exclusive to H. Samuel, this undeniably stylish and sporty men's interchangeable watch strap set by Rotary is sure to turn heads. Featuring a deep blue multi function dial with date window, stainless steel serrated edge case and leather strap, complete with alternative striped canvas strap for a more laid back look. 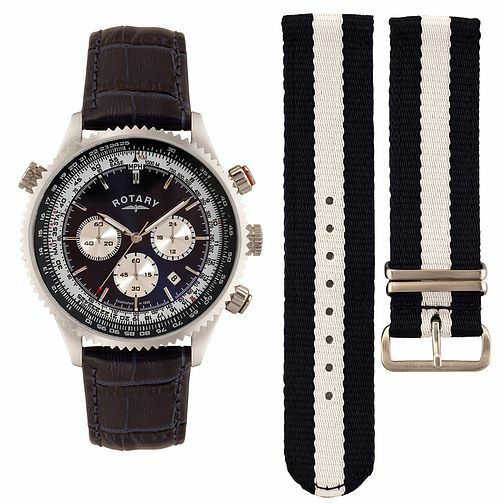 Rotary Men's Interchangeable Leather & Canvas Strap Watch is rated 5.0 out of 5 by 4. Rated 5 out of 5 by Anonymous from A very good quality It was a birthday gift for my hubby. He loves is. Looks really posh and elegant. Suits to everything - casual and more official dress code. I truly recommend this product.